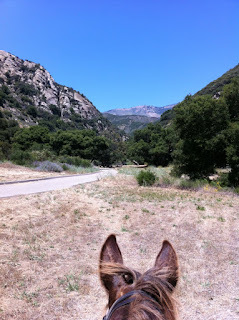 A ride starting at Rancho Oso, on Paradise Road, fording the river and heading up the canyon to the Lower and Upper Oso Campgrounds, then up the Santa Cruz Trail to 19 Oaks. And then, disaster struck. In the Lower Santa Ynez recreational area, behind Santa Barbara, Southern California. 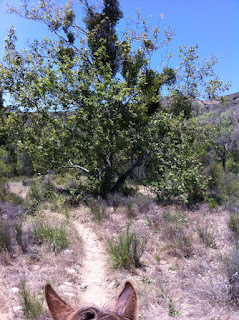 On this map the trail is ONLY from the green start point and up the canyon on the right and back down. I was so agitated when I got to Rancho Oso again I forgot to turn off the GPS until I was on my way out driving down Paradise Road. 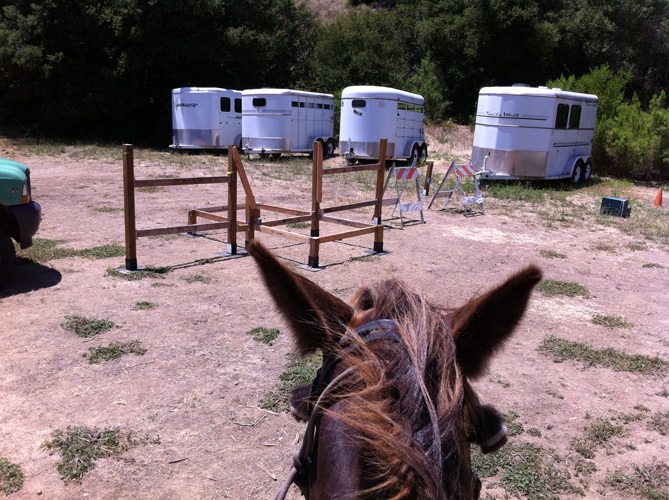 The day started at Rancho Oso, where a landscape architect who is researching designs for manufacturing an OHV-Horse Step-over barrier for the Forest Service asked for equestrians to come and walk their animals through the prototype. 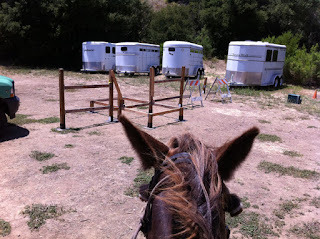 She wanted to to collect information to determine which combination of heights and widths are best to accommodate a wide variety of horses and a string of mules. It was poorly constructed of 2''x4''s, with exposed metal brackets with sharp edges and bolt ends facing inwards, and several animals cut their legs. It will be an annoyance to stock, and would be no hindrance to an athletic motorcyclist who was motivated to get through it. 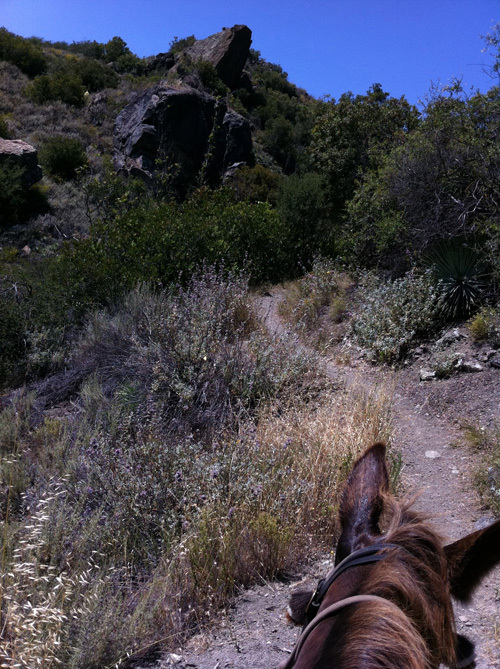 So that was a wasted morning, and I was glad to be done with it and I'd asked several of the people I'd invited to volunteer their animals for the project if they'd like to go on a trail ride together afterwards. Because I was told a large group of rowdy campers were at the White Oak Campground we headed off through the Poison Oak Forest to the river. The mistletoe in this tree stands out in sharp contrasting deep green abundance. The river is lower and calmer now, and very clear. 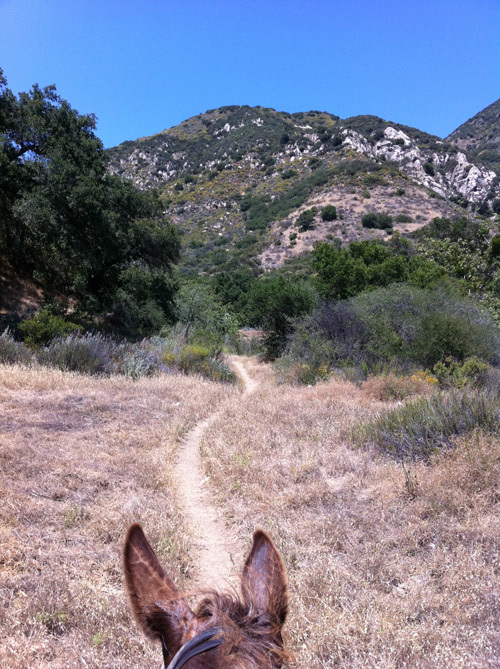 Once across we took the familiar track up the canyon, an easy climb through the now-deserted landscape. Since an access bridge to this area was recently closed and declared unsafe there is no vehicular traffic and thus no campers here. Eerie to have the roads clear of all cars, very quiet. 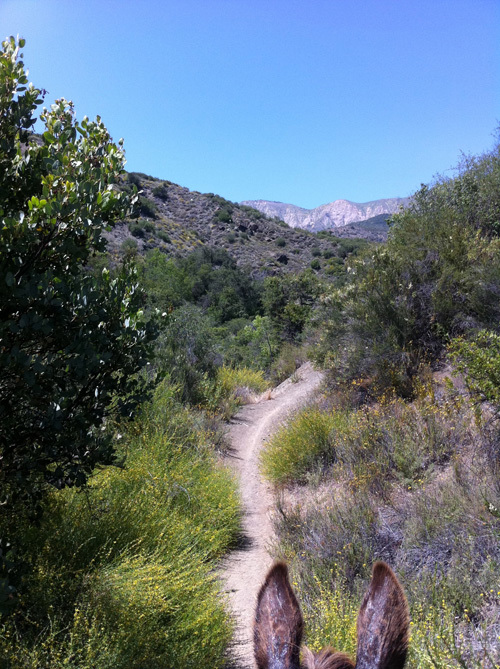 We voted to go to 19 Oaks, so from the Upper Oso Campground we started up the Santa Cruz Trail. There are a lot of narrow places, semi-reinforced worn areas, and rocky sections. 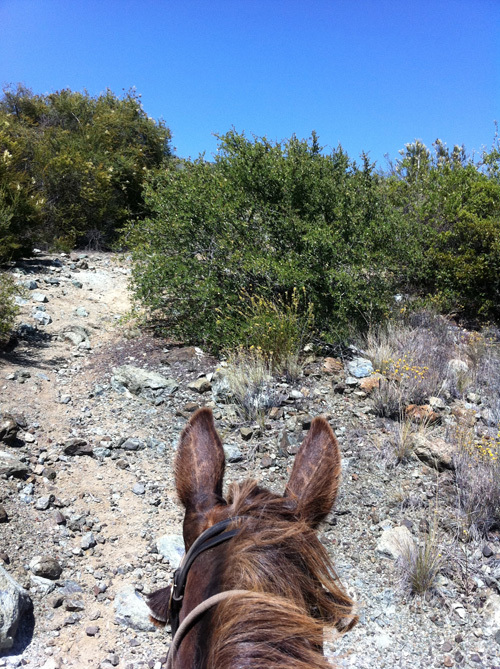 Trails that require navigating around rocks and rubble are no problem for a mule. 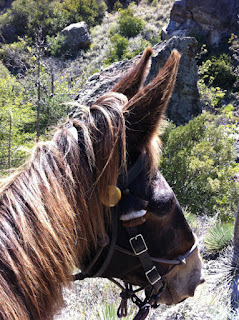 We had 2 mules and 4 horses in our group, and Tobe and I led the way with ease. 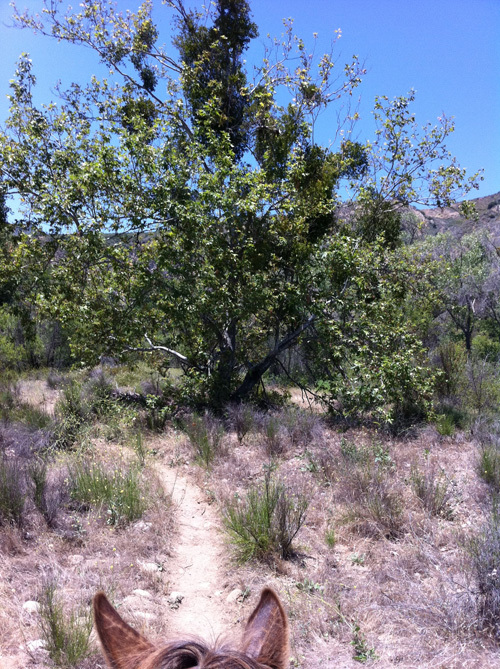 The trails are quite overgrown, so I travel with hand clippers and snip back the encroaching bushes as I travel past. I know I can't be the guy with the crowbar reinforcing the trail with water bars, so I do my BackCountry HorseMan effort by constantly snipping away the branches I can reach so efficiently from the back of my big mule. 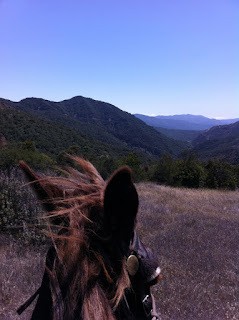 Around every turn is another vista in the distance, presenting the challenge of further explorations in the future. At low spots the trail would unexpectedly be mud and bog, the legacy of the extreme rain this winter, still seeping and finding its way down to the river. The geology of the canyon is stark and commanding. Much of the rock is serpentine, which glows grey-tourquoise and polishes like turquoise on traveled paths. The serpentine against the lighter sand makes a nice contrast, like walking through a field strewn with gemstones. 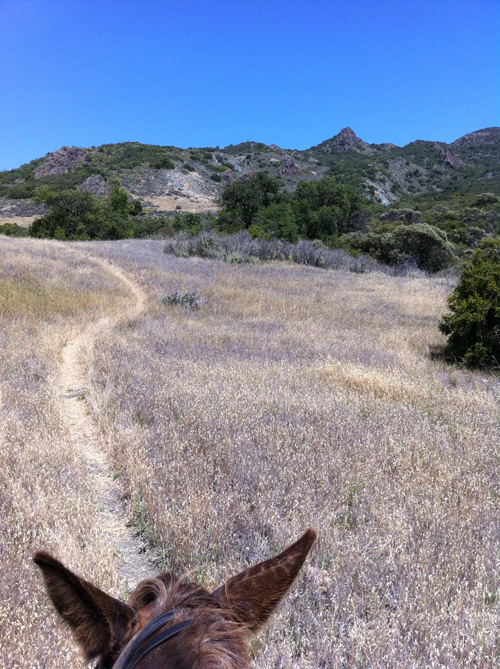 We left the Santa Cruz trail and climbed up to the 19 Oaks campground, and past it to get the best view of the whole valley we had just traversed. One mountain on the horizon looks very much like a volcanic peak. Turning around at the highest vantage point, with the wind whipping through our hair, we catch our breath and see the miles our animals have carried us across. 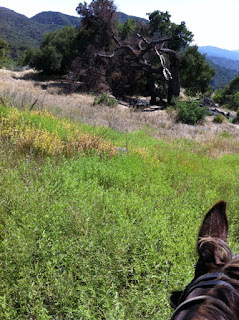 The blasted oak that must have died this past winter, the 19th of the patriarchs of the hill. We started back down, Tobe calmly carrying me back down the trail and with no premonition that something terrible was going to happen. And in fact I don't actually know precisely what DID happen. 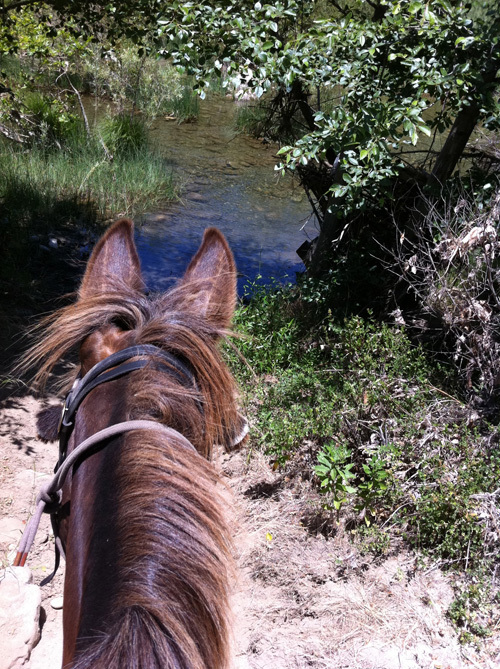 The two mules were in front, the horses following, and then I suddenly heard what I thought was the sound of children shouting , playing in the river at the bottom of the canyon. But we hadn't seen anyone else on the trail, it didn't make sense. 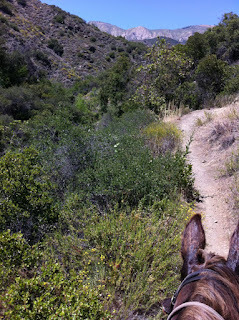 So the other mule rider and I had to go down quite a ways before we could find a place wide enough to turn around, and we went back up. 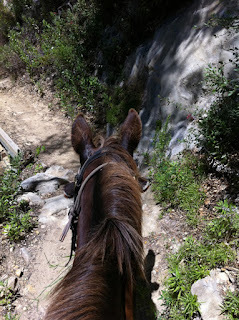 One of the Forest Service employees we had been riding with had fallen off the trail and was screaming at the bottom of the canyon, and her horse was caught up in dense brush 10' below the trail struggling to regain his footing. She was climbing back up and I asked how badly she was hurt and she replied that she had to go to an emergency room immediately. So since there is no mobile phone reception in the canyon, the other mule rider and I opted to get back to civilization as quickly as we could and call for 911. The mules trotted down at high speed, I have never been so grateful that I ride my sure-footed hybrid. We got to the camp host's cabin and hollered for help, when I yelled "FIRE!" they popped right out. 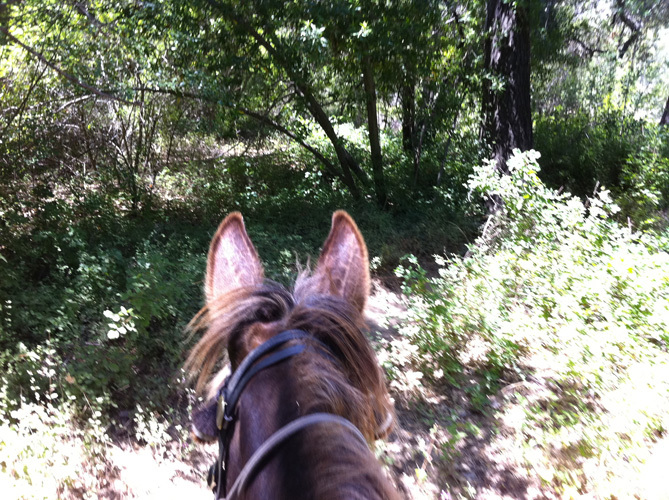 They had a satellite phone and I was able to call in 911, request a med evac helicopter to land at 19 Oaks and whisk the gal out to the hospital and Equine Evac for the horse off the trail. There was no point in our going back when professionals were en route, so we continued out of the canyon and saw Forest Service Patrol, Fire Battalion, Sheriff, and ambulance all heading up to as close as they could get on land, plus we heard the helicopter coming in. She was airlifted to the airport then taken by ambulance to the hospital. Then, when I got home and logged on to the local news online resource EdHat I was shocked to read that the medics etc were all en route BACK to the same location, where a second rider was transported by ground ambulance to the hospital and a second horse was thought to have a broken back. I later spoke with most of the people involved and it is wonderful that there were no major injuries and both riders and both horses are going to be fine. 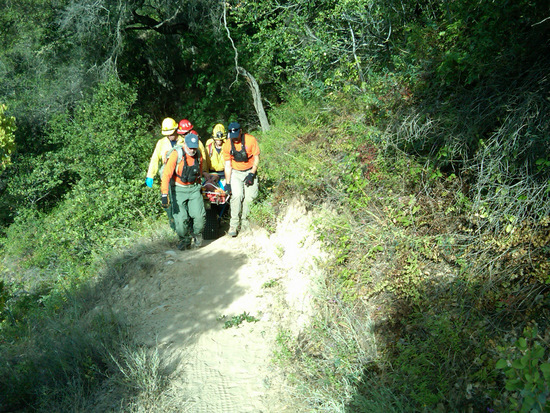 Emergency personnel from the Santa Barbara County Search and Rescue, U.S. Forest Service, Santa Barbara County Fire and AMR Ambulance combined late Saturday afternoon, June 18, 2011, to respond to three different incidents, each requiring the rescue of individuals. Two being related to injuries suffered when each of their horses fell off the trail down steep canyon sides and the third related to a mountain biker falling over a bridge a dozen feet down into a creek bed. Early in the afternoon a group of Forest Service employees along with a couple of horse wranglers rode out from Rancho Oso and up to 19 Oaks Campground located on the Santa Cruz trail approximately 2 miles north of Upper Oso Campground in the Paradise Canyon area. 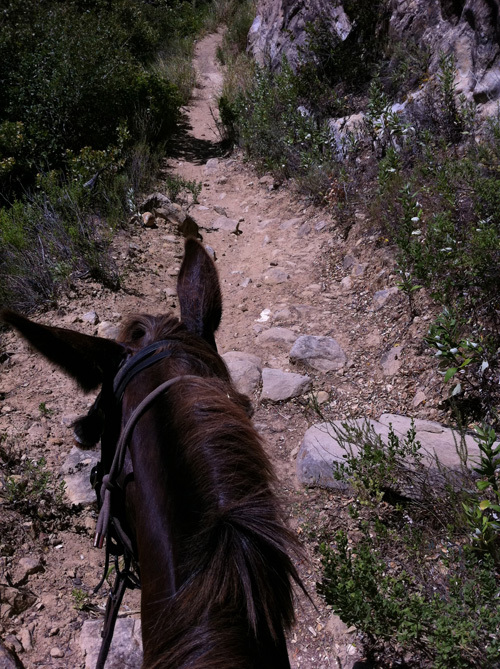 As they were coming back down the trail one of the female Forest Service employees along with her horse went off the side and fell into a steep deep canyon. Complaining of injuries some of her companions rode down the trail until they could obtain cell coverage at Upper Oso to dial 9-1-1. Dispatchers with the Santa Barbara County Sheriff's Dispatch Center then initiated a multi-agency response. An engine crew from the U.S. Forest Service along with a County helicopter eventually was able to locate the subject. After initial emergency treatment the ground personnel were able to carry the injured horse rider in a stretcher up to a clearing where the helicopter then transported subject to Santa Barbara Airport where she was transferred to an AMR ambulance for transport to Cottage Hospital Emergency Room where she was reported in stable condition later that night. As personnel from the Santa Barbara County Sheriff's all volunteer Search and Rescue team were responding across the first crossing of the Santa Ynez River they received a report from a hiker that a mountain biker had fallen off a nearby bridge and was injured. Upon arrival, Search and Rescue members found a male in his late thirties lying down in the bottom of a creek bed bleeding from a cut knee and a lacerated head wound. Apparently the rider was trying to negotiate his bike around the lock gate at one end of the bridge when he lost his balance and tumbled over the side down about 12 feet, hitting his head on a rock. SAR EMTS administered first aid to the subject and then directed an AMR ambulance crew standing by for the horse rescue, to respond to evaluate the subject for transport. Paramedics from AMR evaluated the subject but he refused further treatment and was released. About this time a second horse rider was reported to the rescue crews still stationed up at Upper Oso. Two of the horse riders with the original U.S. Forest Serviced ride had started down the trail back to Upper Oso when the horse in the front started to turn around on the trail, causing his rear legs to slide off the side of the single track trail and down a sheer 30 foot cliff down to the rock creek bed below. Upon hitting the creek bed the male rider in his late fifties was flung off the horse and hit his head and back on large rocks before coming to a rest. 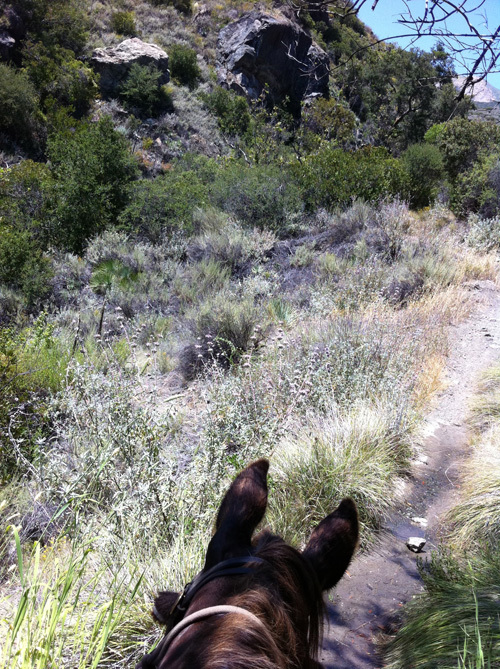 Personnel from Search and Rescue, County Fire and Forest Service once again hiked up the trail and found the injured subject in the creek bed with his horse also lying near him. The subject was immobilized for possible back injuries and lashed into a stretcher whereupon members of all three agencies then worked together to lift him out of the creek bed and back up to the trail where he was wheeled out to Upper Oso for transport by an AMR ambulance crew to Cottage Hospital Emergency Room where he was also reported in serious but stable condition. During this time the subject's horse got itself up into a standing position but was demonstrating signs of being in shock from her fall and injuries. Two members of County Search and Rescue stayed with the horse while her owner was carried out. Several SAR members then returned to assist after transferring the injured rider to AMR. After calming the horse down SAR members were able to scout out a route and safely encourage the horse back up to the trail where she then was slowly walked out to Upper Oso and turned over to personnel from the Equine Evacuation Rescue Group. While left shaken and with a lot of cuts and bruises, the horse appeared not to suffer any life threatening injuries. All rescue personnel departed Upper Oso at approximately 7 pm after completing a string of rescues in quick succession.